These past few weeks my baking projects have been in full swing. There was my nieces birthday cake, the following weekend I had a close friends baby shower to attend and was asked to make some cupcakes for it. I’ve known this person for over 10 years and many of of friends and family were going to be there so I had to make sure these cakes looked excellent! 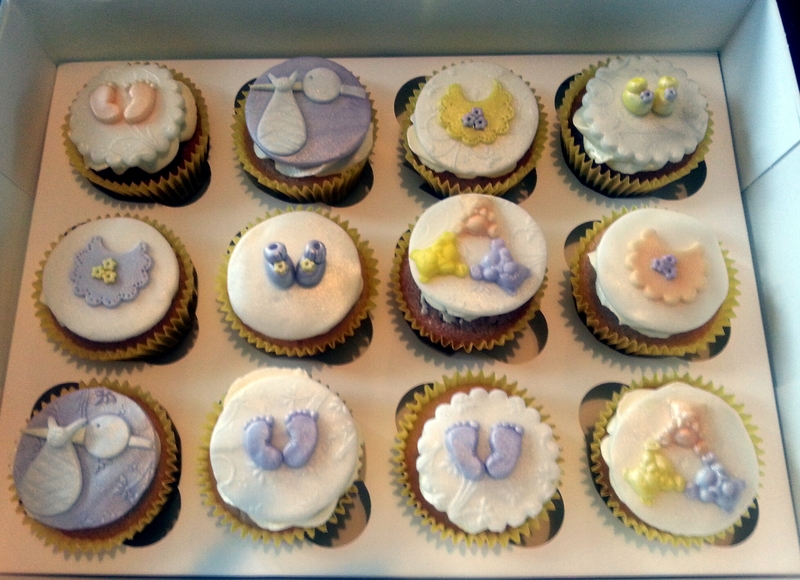 I have made a baby shower cake for my sister in the past so I had idea how to make baby related fondant decorations. Still I did a bit of research into the different designs I could try, colour combinations etc. Throughout my baking experience I’ve found doing a bit of research beforehand and having a few practice runs makes life a lot easier. If you want to see any of my other cake designs / baking challenges you can check out my Facebook cake page. As it is National Cupcake Week and it has been a while since I last brought in cupcakes to work I decided this was the perfect opportunity to try out a recipe. 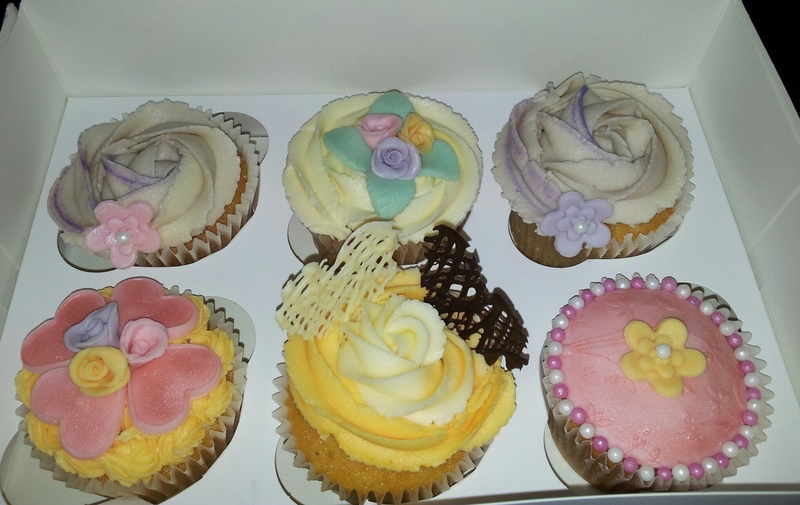 Whilst browsing the National Cupcake Week website I came across the Marie Antoinette Cupcakes, by Peggy’s Cucakes. This recipe was different to the traditional sponge recipe as it also used milk and as it so happened I had some milk that had a few days left before it expired. I made a few substitutions / additions, instead of vanilla extract I opted for orange and added a selection of white and milk chocolate chips. 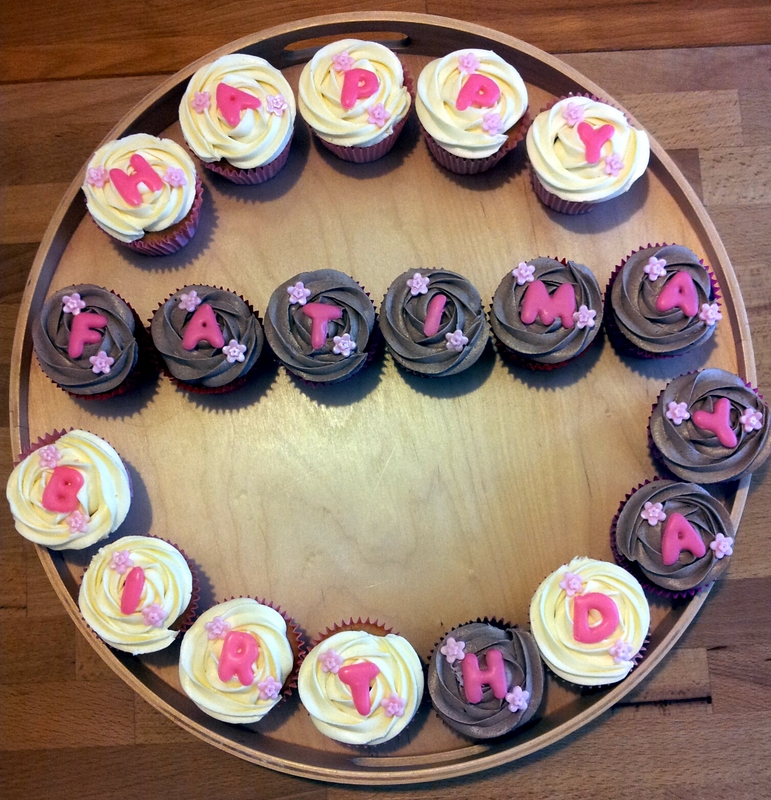 I didn’t go all out with the decoration instead choosing an orange flavoured buttercream drizzled with dark chocolate. 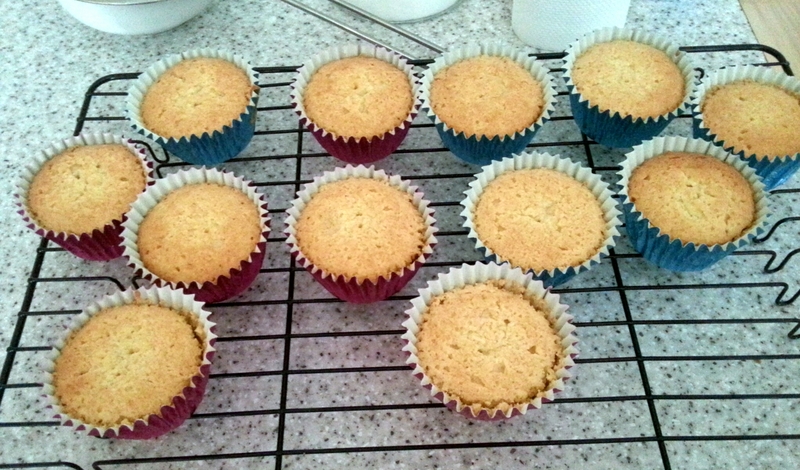 The end result was the cakes came out of the oven soft and spongy. Despite orange extract being added to both the cake mixture and the icing there was only a subtle taste of orange, this could have been because I forgot to brush the cakes with a flavoured sugar syrup whilst they were still warm. I used my own buttercream recipe ( 150g butter, 1 teaspoon orange extract, 280g icing sugar) but reduced the amount of icing sugar used so it wasn’t as sweet as I would normally make it, I think this worked well with the chocolate. Overall the cakes seemed to be popular with everyone or maybe they were just happy with some free! whatever the reason they got eaten and I think they looked very cute. 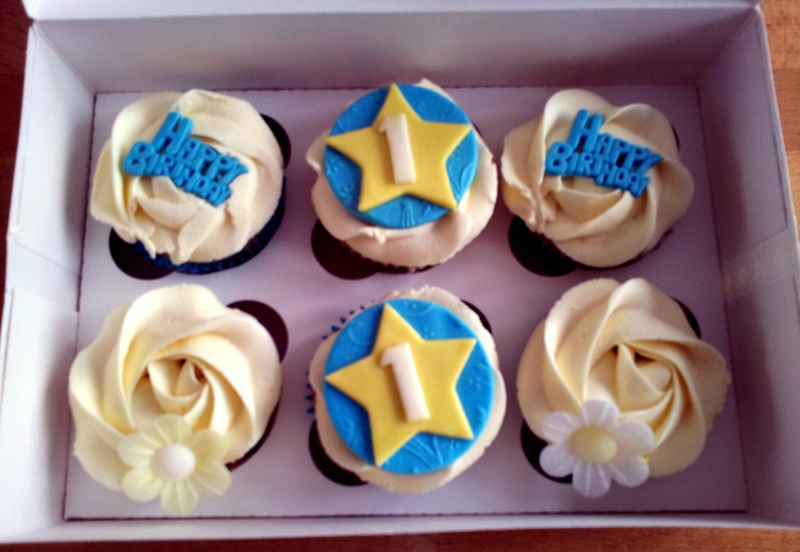 You can find instructions how to decorate the cupcakes in the original design on the national cupcake week website. Beat together the butter and caster sugar until mixture is light and fluffy (about 5 minutes in a mixer) Beat in the eggs, one at a time, adding a spoonful of the flour with each egg. Add vanilla. Fold in 1/2 remaining flour and salt. Fold in the milk. Fold in the remaining flour and salt. Divide the mixture between the paper cases and bake in the center of the oven. Bake for 17 minutes. Got my baking mojo back! 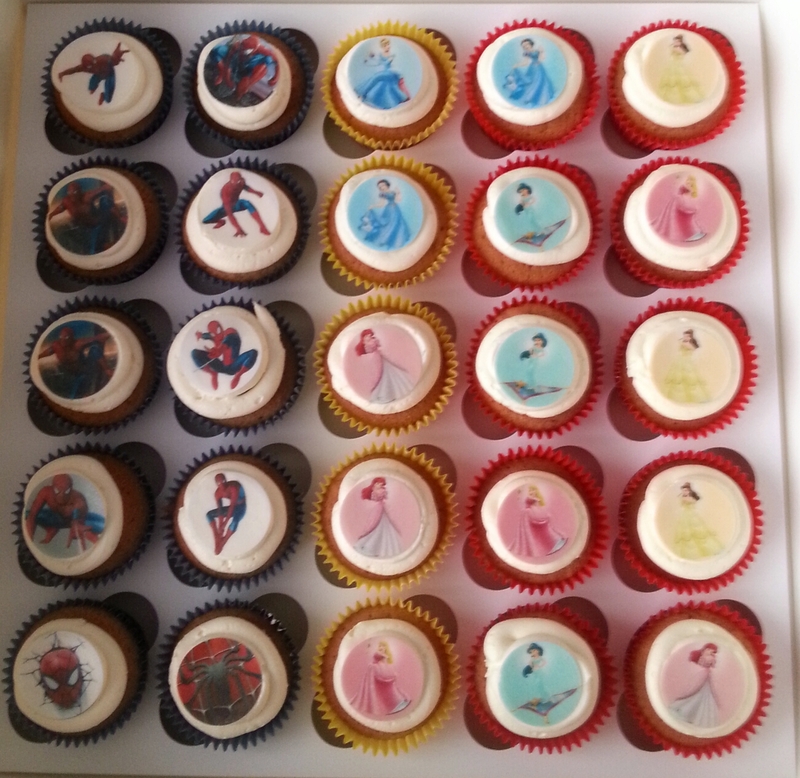 A few weekends back I had to make some cupcakes for my eldest nephew’s birthday party with his nursery friends. 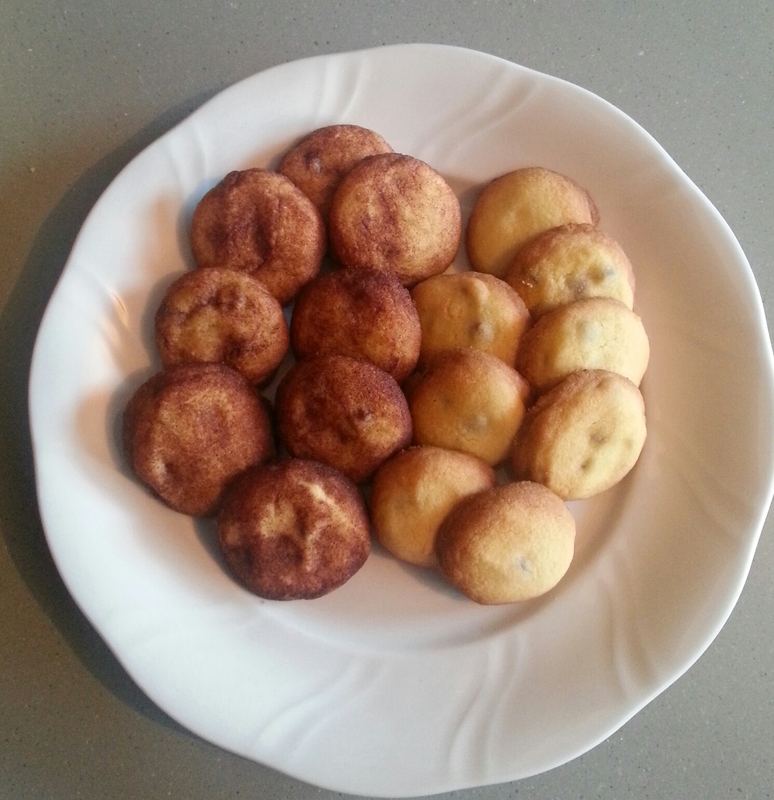 , for some reason I just seemed every batch seemed to be turning out worse than the last one. There was no way I was going to be able to present these to the kids. For whatever reason the cakes kept coming away from the cases. I read that it could be the cakes were underbaked or there is too much moisture in the cake so I cooked the next batch a bit longer and they were awful, over baked! I eventually got fed up and went to my mums and made the cakes there, in the end they turned out the way they usually do. I decided I need a bit of a break from work spent a few days visiting Canterbury and Tropical Wings. I had been wanting to visit Canterbury since I saw it featured on an episode of the Hairy Bikers. It is a nice place, lots of independent shops down some side streets as well as your shops you can find and almost any high-street. It was my first time visiting Tropical Wings, if you have kids it’s a nice place to take them, even if you don’t have kids it’s a still a nice place to visit. The saune part is where you’ll find the butterfly’s and other animals you would likely find in a tropical environment. Outside the zoo is where animlas like Lizards, Meerkats, goats etc can be found. For some reason one nephew just wanted me to carry him, it was a mission getting him to go to anyone else, back is paying for it. I haven’t forgotten my cinnamon challenge, last week I made cinnamon coated chocolate chip orange cookies. These biscuits are fully of butter and sugar but are crumbly and addictive. Reason why I shared them out amongst family and work colleagues. it was also on this day I managed to break my mum’s micorwave. I’m told that it wasn’t my fault and that the microwave door was getting stuck it just so happens that it remained shut when I used it and it decided to turn on and not switch off! I’m not sure what my mums plans are for the microwave as it is built in but is using a free standing one for now. I have offered to pay for repairs. 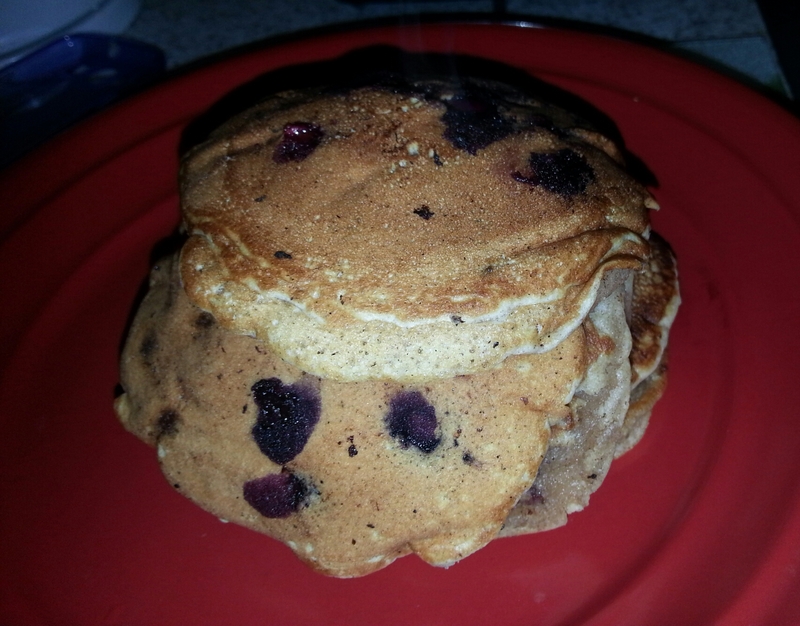 Whilst I was in the baking mood this week I wanted to try some blueberry pancakes and found this easy recipe online, plus it also uses a bit of cinnamon. I added a bit more sugar than the recipe stated as I wanted them a bit sweeter. Overall this was the first time I enjoyed homemade pancakes. It has been hot, I don’t mind a bit of heat but this humidity is doing nothing my hair! In my blog piece heatwave I talked about how a bit of sun can affect people’s fashion sense. Subtle requests for people to dress with some class in this weather has fallen on deaf ears resulting in sunny Cornwall taking a more direct yet polite approach with this sign. Whether members of the public heed this advice is another matter, made me laugh anyway..I know I have a problem, I’m a sizeist, I’ve come to terms with it! I maybe venturing into the lions den this weekend, also known as my sister’s house, a water fight may possibly be on the cards depending on the weather. You’re not ever too old for a water fight, though I have a feeling the cute faced nephews are not going to play fair..hmmm. Don’t be fooled by the angelic exterior of children, beneath the surface lies a crafty and clever being that can play an adult without them even knowing they have been ‘had’ by a child. Don’t turn your back on them either, silence with kids is a bad thing, that is when they are plotting. I’m sooo going to lose at this water fight, maybe we’ll just play in the park instead, it sounds like a much safer option…for me. I like baking, I like eating the occasional sweet treat. 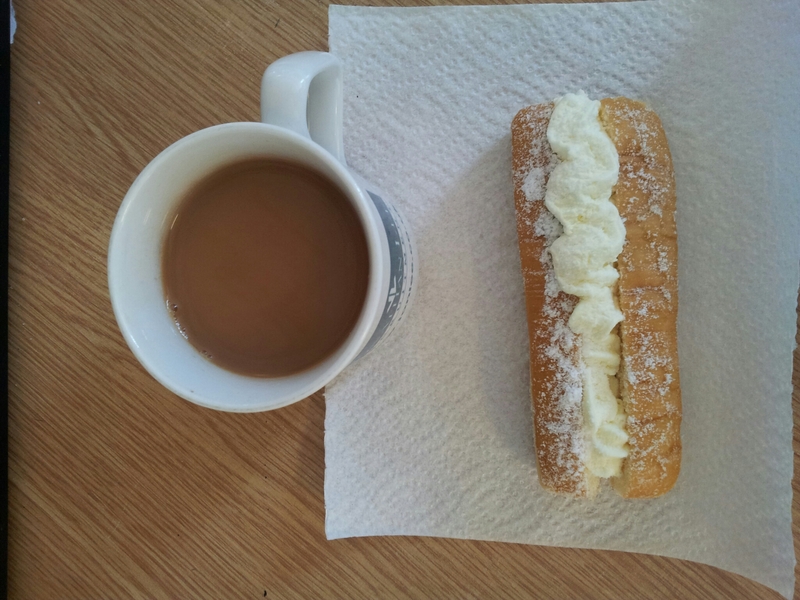 Throughout the World Cup it seemed my office turned into a mini bakery, if my breakfast didn’t contain at least one cream cake there was something wrong. The people on my floor were doing a sweepstake guessing the winners and predicting the score. 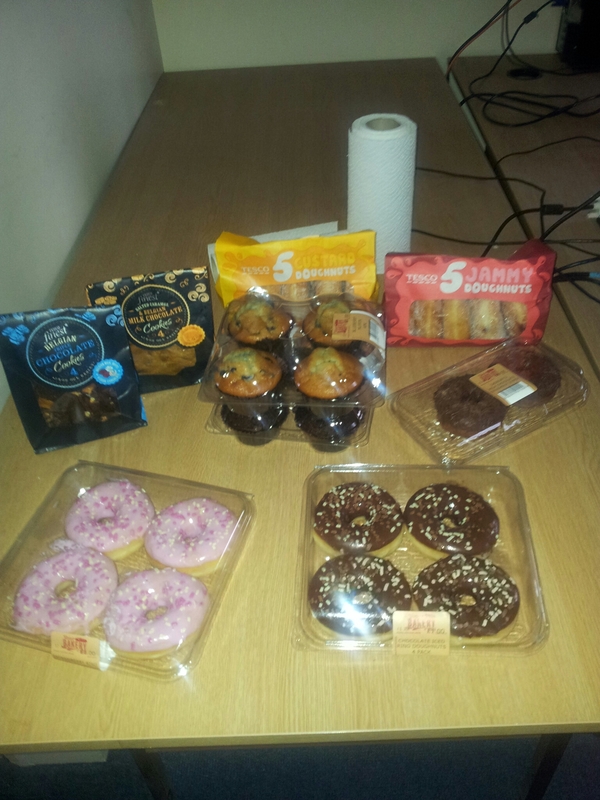 For some reason the winner of the sweepstake then brought in cakes for everyone. The warm weather does make baking difficult. Aside from the fact the oven heats up the kitchen and living room whilst I’m trying to keep the house cool with open windows, doors and a fan. 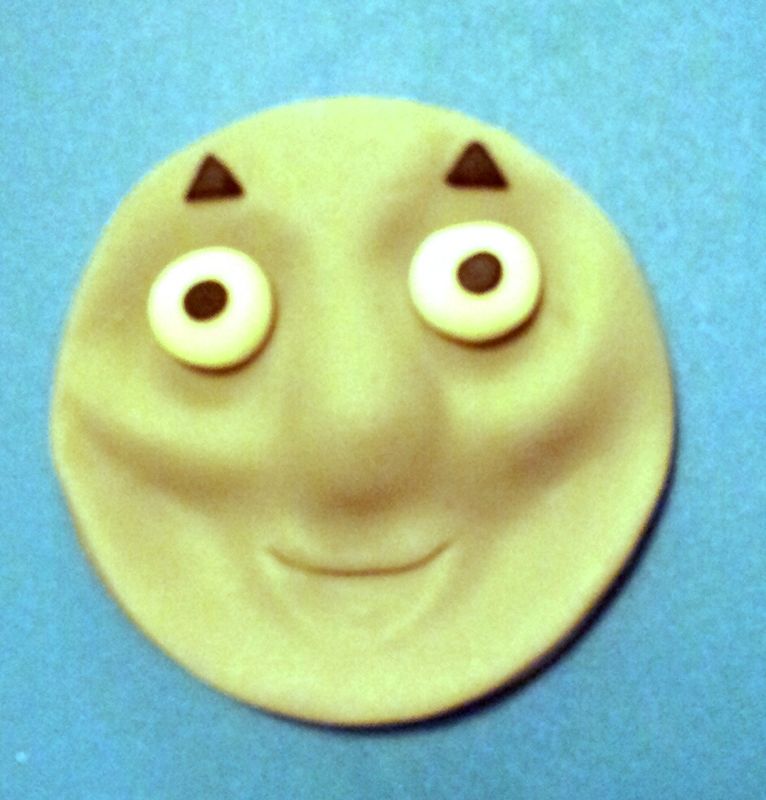 Working with fondant is a trial, as for working with chocolate complete nightmare. Still somehow I managed to put these little cuties together. Cake me baby one more time! I’ve been having a bit of a baking fest, it had been a while since and I missed it! At the beginning of the month it was my sister’s birthday, the majority of us got together the weekend before to celebrate. Instead of a birthday cake she had birthday cupcakes made by yours truly. This way there was no faffing around with cutting and who got the bigger slice. The most difficult decision was which flavour and letter to go for! For a change my demonically yet angelic nephews ate all of the cake and not just the icing. I’m not sure if this is an acquired taste, during my drizzle cake experiment phase I used limes and tested the end results out on a friend and her kids. It’s not a completely unpleasant taste but as this friend put it the taste was ‘unusual.’ Saying that, her kids liked it enough that they have been asking for some, so I made them some. 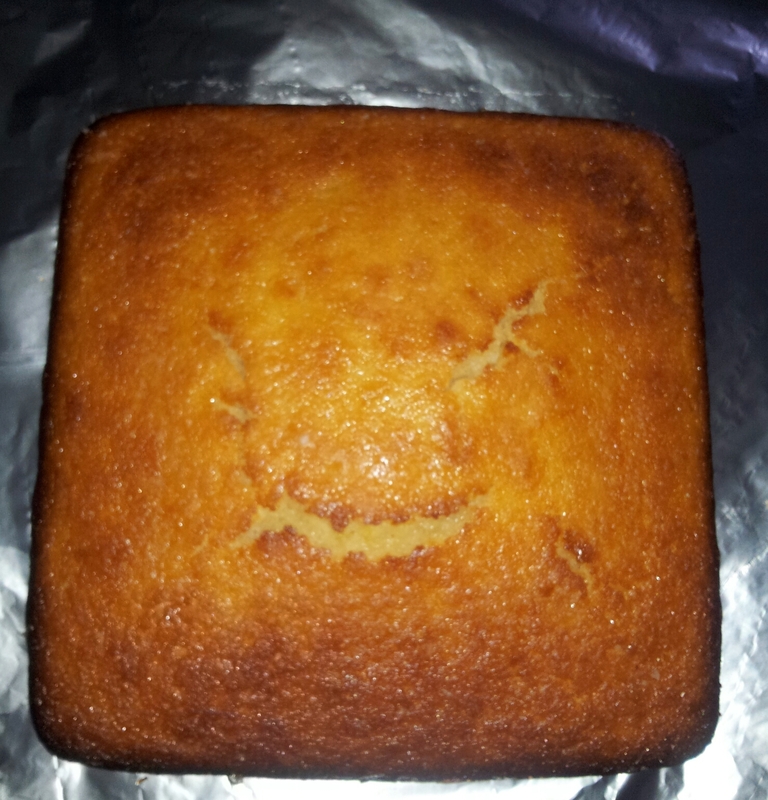 It could be my own creative imagination but when the cake came out of the oven it looked like there was a smiley face on top, it was a happy cake! It was a week for unusual baking, I’ve heard of using beetroot in chocolate cakes but not ever sweet potato. A friend at work brought some sweet potato brownies in, the guys had to guess what the secret ingredient was, one person suggested Marmite! 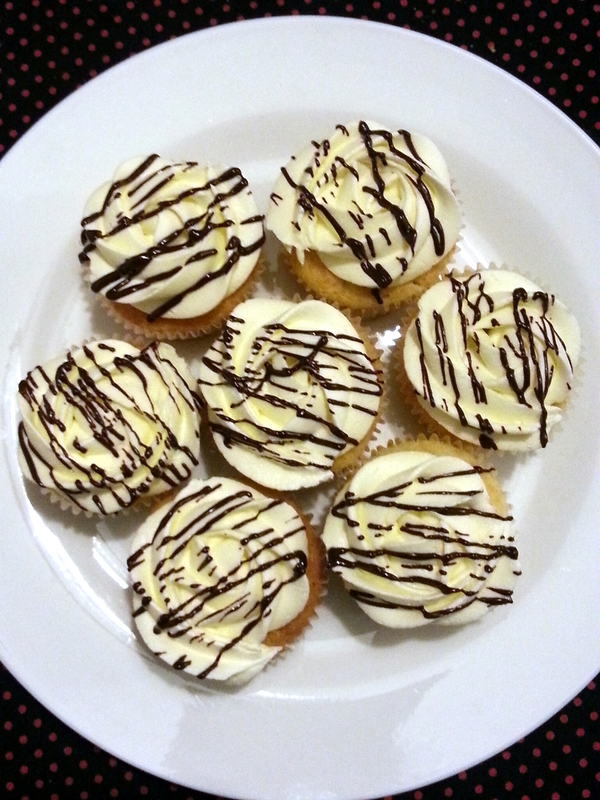 FYI there is a recipe to make Marmite cupcakes. On top of baking there have been a few birthdays, so this was my breakfast for a few days. 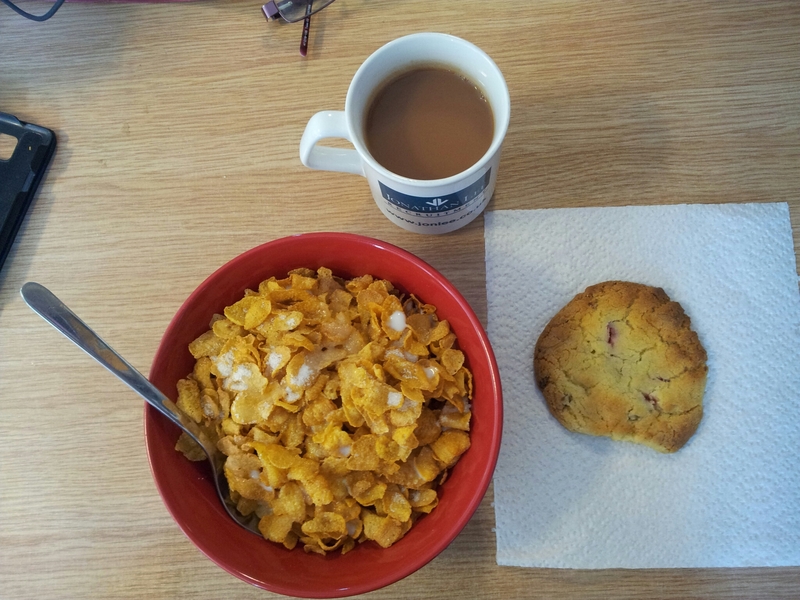 Not the healthiest but also not a bad way to start the day. Although it has been one of ‘those’ weeks it could have been much worse. Got up late for work, for some reason switched the alarm off! Still getting used to new oven and nearly burnt chocolate muffins, they were at the stage just before crispy! No kickboxing at all this week! Just because there were a few negatives doesn’t I’ve written off the entire week. 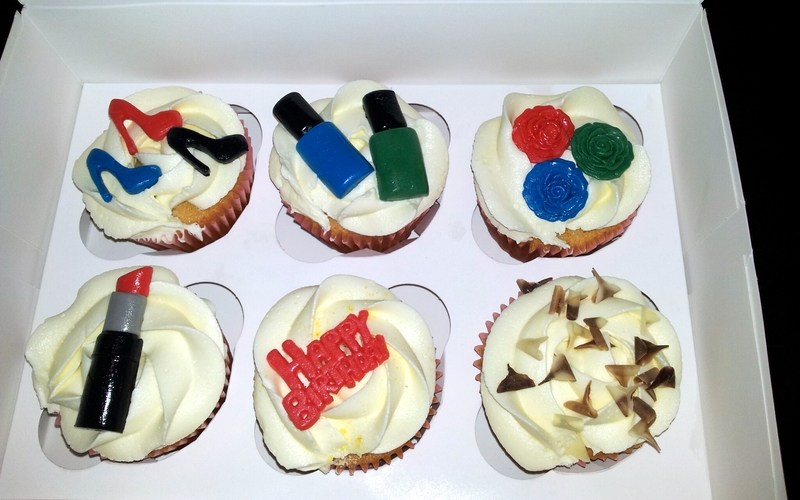 Dropped some birthday presents and cupcakes for a friend’s daughter, she is into baking and has taken part in theatre productions of High School Musical and Little Shop of Horrors. Also managed to have a quick catch up. My front garden fence has been put up and it looks good! I am going to have to re-think how I buy makeup, unless the item is all sealed like fort knox I’m not buying it! During a shopping tript with my mum I was looking at buying some new mascara. Whilst at a counter I noticed another customer try on lipstick and put it back, and it wasn’t a tester!! My mum noticed and I was speaking quite loudly about how disgusted I was by this persons behaviour, what if she has a cold sore?!?. I couldn’t see which lip gloss she tried on else I would have taken it to a sales assistant, I should have taken them all off the shelf. I think I saw this girl do it again at another counter. I was going to speak to a sales assistant but my mum didn’t want a scene The makeup I bought was all wrapped up with no seals broken. Just how dirty and disrespectful are people? If I was that skin confident I would go makeup free, luckily I barely were lipstick otherwise its good old Vaseline. This weekend a friend is popping round for dinner, followed by Sunday with my nieces aqiqa. Before the death of my oven I had already agreed to make some cupcakes for my tenant who would be changing jobs and wanted to take in some leaving cupcakes. Still without a working oven I once again took over my mum’s kitchen. I had already made some of the fondant decorations but with 20 cakes ( I made a few extra) to make there were going to be a lot of decorations. My tenant had left it to me to decide what type of decorations to do, so I mixed it up with fondant decorations and simple piped buttercream on top. From what I have heard they were a hit. I won’t have to annoy my mum and take over her kitchen again as my new cooker has arrived and has been fitted! I haven’t used the oven yet, it’s a friend’s daughter’s birthday coming up so I may test out the oven making her a few birthday cupcakes. 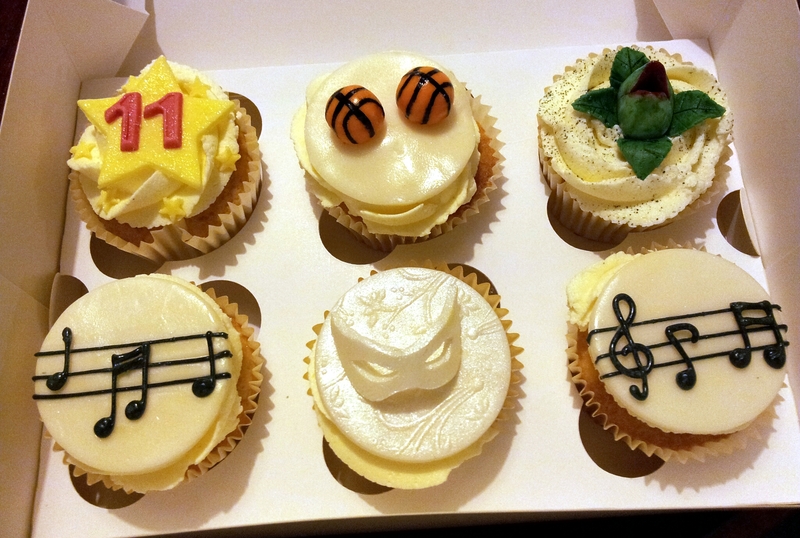 Her daughter is into theatre, music as well as the obligatory girlie things so will have a think on how to decorate her cupcakes. I’m steadily getting back into kickboxing both physically and mentally. To improve my flexibility one of my instructors have advised I do squats and lunges with weights at home. OMG!! Booty, legs the works are feeling the burn! I know the phrase ‘no pain no gain’ buuttt at the moment all I’m getting is the pain, when is the gain coming my way?? My sister is planning an aqiqa; blessing but asian style- for my niece, I needed a new Asian outfit for the occasion as all the ones I’ve got have too many many sequins and design work on them. My brothers girlfriend had decided she would also like to wear an Asian outfit so was invited along to a shopping trip to Ilford Lane, Essex. She had been warned by my brother and one of his friends about Ilford Lane beforehand though luckily it was a good day. Maybe because the sun was shining or we’d entered the twilight zone but everyone including the other drivers were in a nicer, politer mood. My youngest sister wasn’t able to come along so I was tasked with trying to find her something, shop after shop, I took pictures of so many outfits to send to her all of which weren’t up to standard..I begun to lose the will to live! Finally I found an outfit and in the right size for her. When I dropped it off at my parents she was happy with it and it fitted, good thing too because I wasn’t going back to change it! The image to your right was the outfit I got my sister. Whilst out and about it had started to get late and we also had my niece with us so decided to get some Indian take away, I also got my tenant some chicken curry! By the time I had dropped the clothes off at my parents and got home I was so exhausted, I think I was running on adrenaline as I was a bit hyper, hungry and tired. Wish me luck, I’m off to get my booty kicked tonight! I survived the kids party! The weather was pretty shocking Friday night, it had improved by Saturday but the QE2 Bridge was still closed. My sister contemplated whether to still go to the party or not, three kids in the car stuck in potential traffic was not a tempting offer! We braved it and were lucky there was hardly any traffic and the kids slept most of the way. Sunday I was back at climbing. I hadn’t been for about two weeks and missed going. It was exhausting and I managed to climb up one wall that I had been struggling with for ages! My brothers had no problems with this particular wall with them being taller than me did make a difference. By the time I had made it back down and had both feet planted on solid ground I was exhausted but also impressed with myself. I almost forgot, although my wrist strapped up, it’s been a few days now and no aches so far. 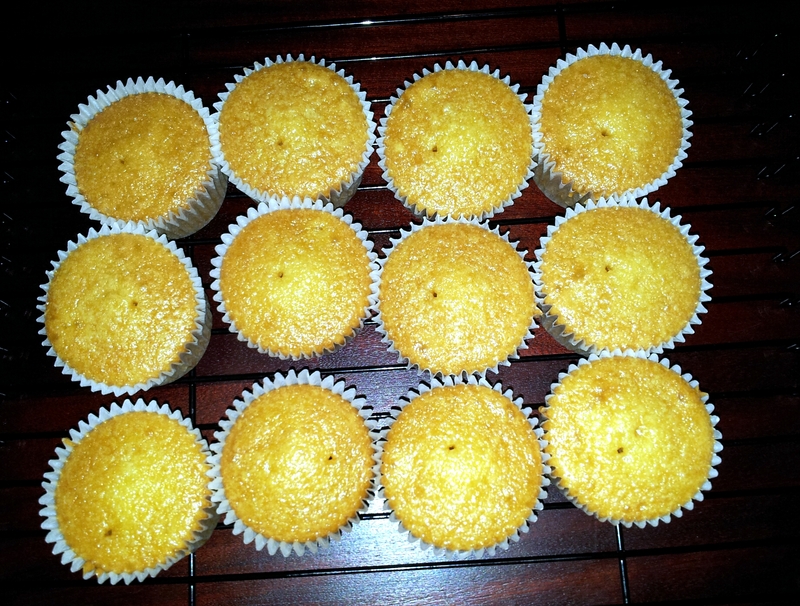 :-D.
Back home, I had been wanting to try out an eggless cupcake recipe. I may have slightly overworked the mixture a bit, apart from that the cakes turned out better than I expected, light, spongy, they rose and didn’t sink when they came out of the oven! 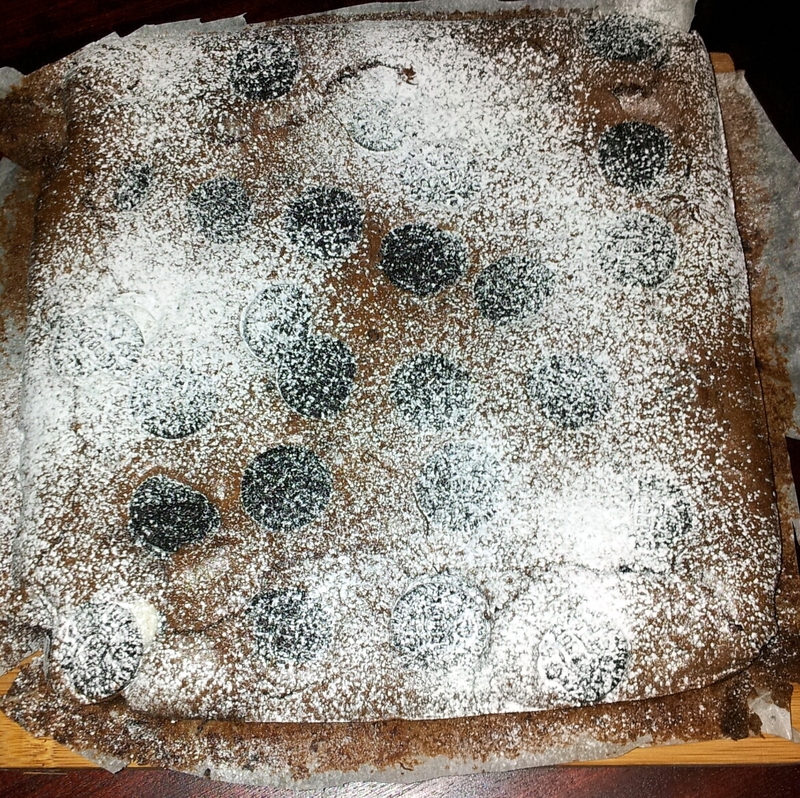 What the cake lacked in sweetness the buttercream made up for. I’ve being trialing them out on some friends who I know will give an honest critique. There are a few things I will do differently next time, the recipe called for vegetable oil but it made the cakes look dark brown, I’ll try sunflower oil instead. The next step for me is to decorate some dummy cakes to showcase my decorating skills. The weather over here in the UK has stepped up this week. USA have snow we’ve got torrential rain with parts of the UK being submerged underwater. We’re not at the fabled Atlantis stage but keeping arms bands close to hand wouldn’t go amiss in some areas! Fortunately I don’t live close to the coast, the most I have to worry about is either have to drive through areas that over night a mini pond has appeared or being blown away by the wind. There’s no point even spending time on my hair these days as the wind manages to give me that ‘wind swept’ look which I can’t pull off, all from just walking to and from my car. 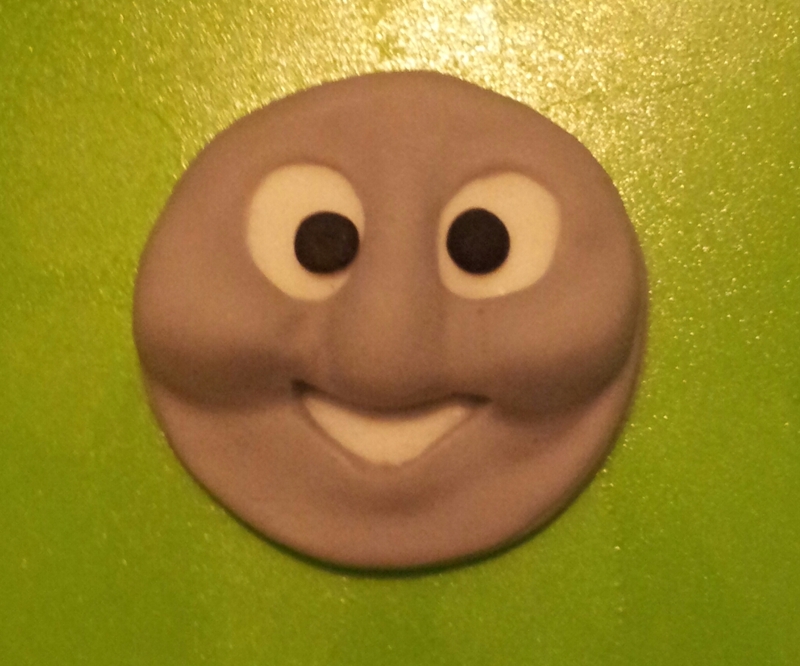 Weather news aside, I have been busy either baking or working on perfecting a fondant Thomas The Tank Engine Face. 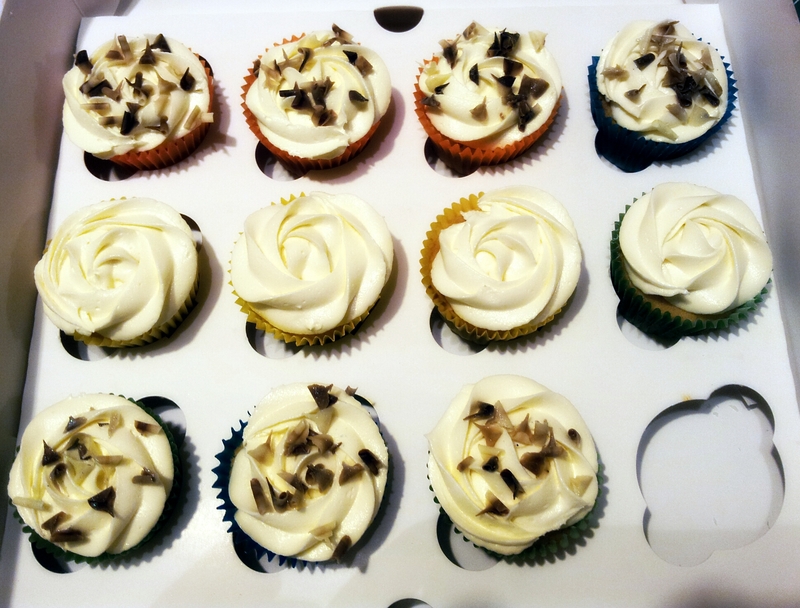 I baked a batch of cupcakes for my first non family or friend related customer. I was nervously excited and went to bed extremely late Friday night but in the end it was worth it. 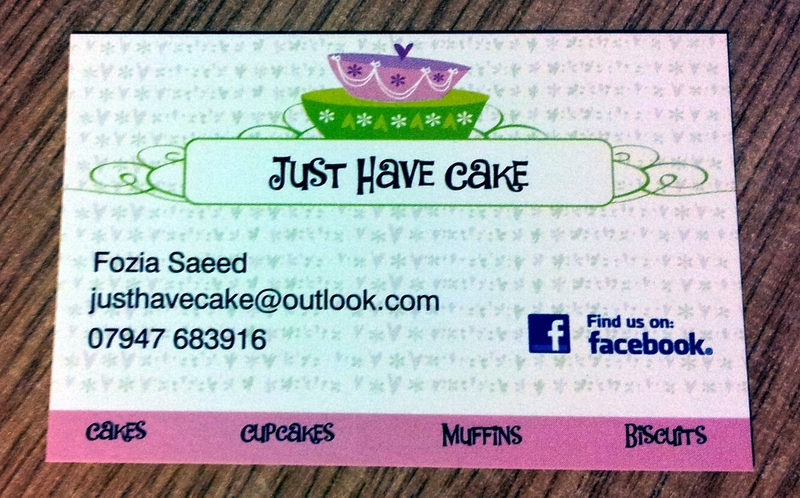 My business cards arrived this week, they were delivered to my place of work. I’m glad I work with a group of people who are used to me, when I opened the box I was like a child opening her presents. 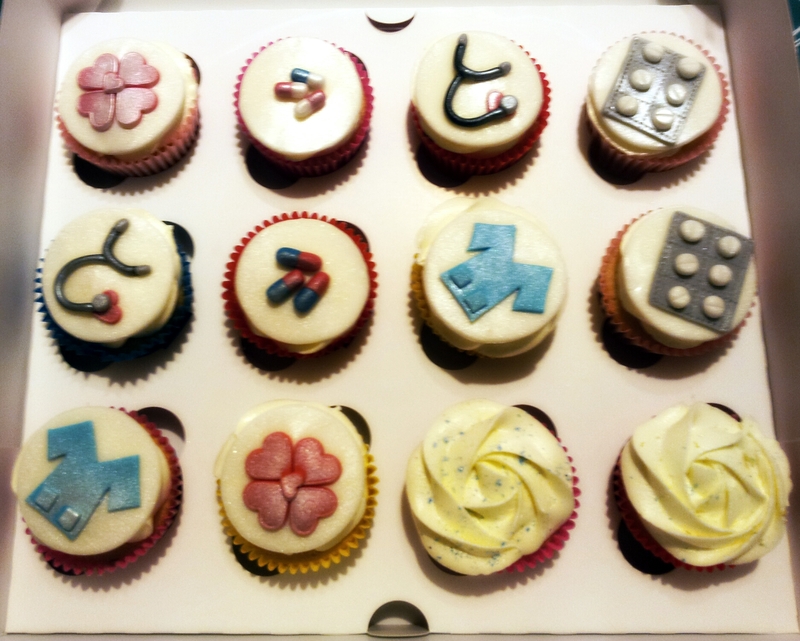 Next step is to continue to make the cupcakes with a variety of designs, muffins and biscuits palm them off to others to taste, along with the business cards. Additional marketing ideas I am going to look into as well. I have been investing in a few cake decorating tools, some of which I’ve already used, others I’ve yet to try out. 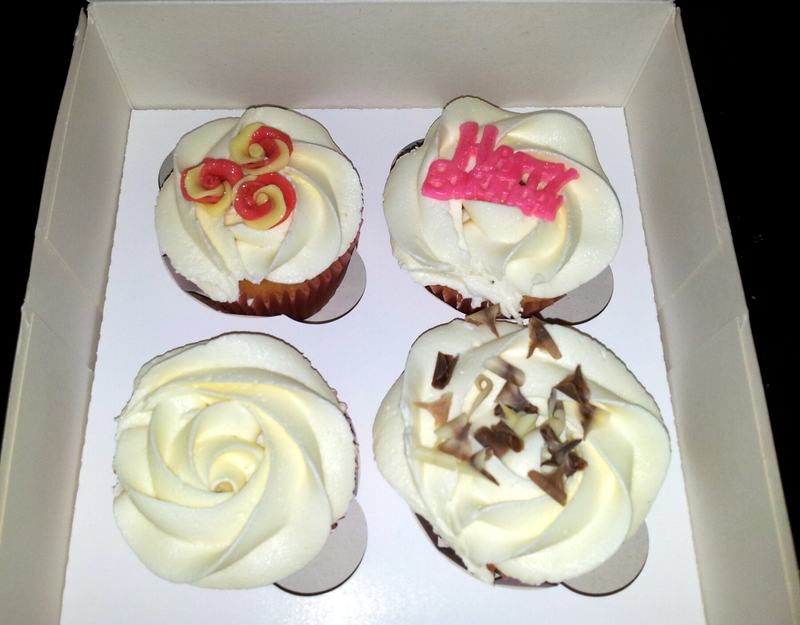 Over the weekend, after delivering the birthday cupcakes I met up with friend & her husband. 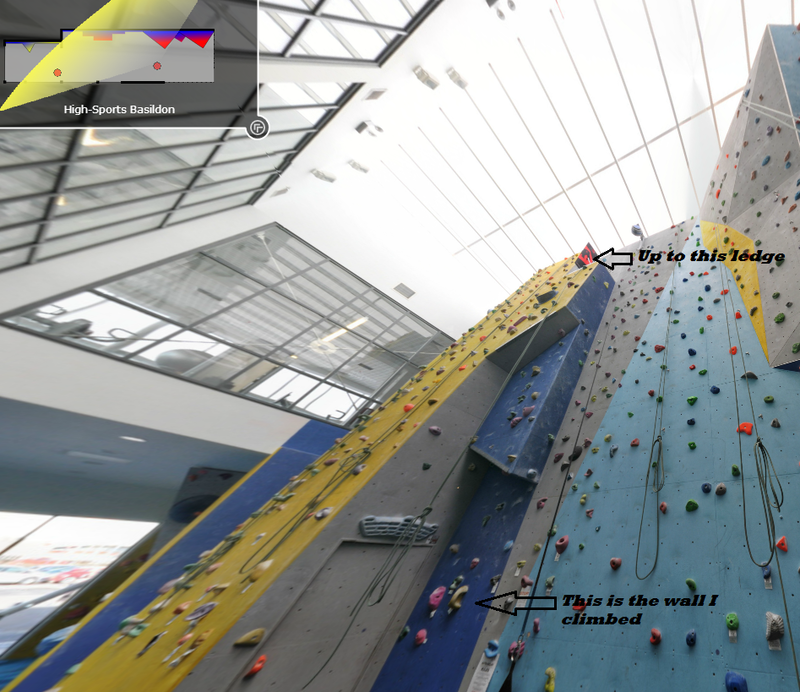 We had planned to go for a climbing session at the Basildon Sports Village. This was their first time climbing and my first time mentoring. There were other experienced instructors on hand to help me out with anything I had missed out when ‘teaching’. On the whole I think it was a good session, I think my friend’s husband enjoyed it slightly more than her. We’ll see if they decide to give it another go. Onto Thomas. 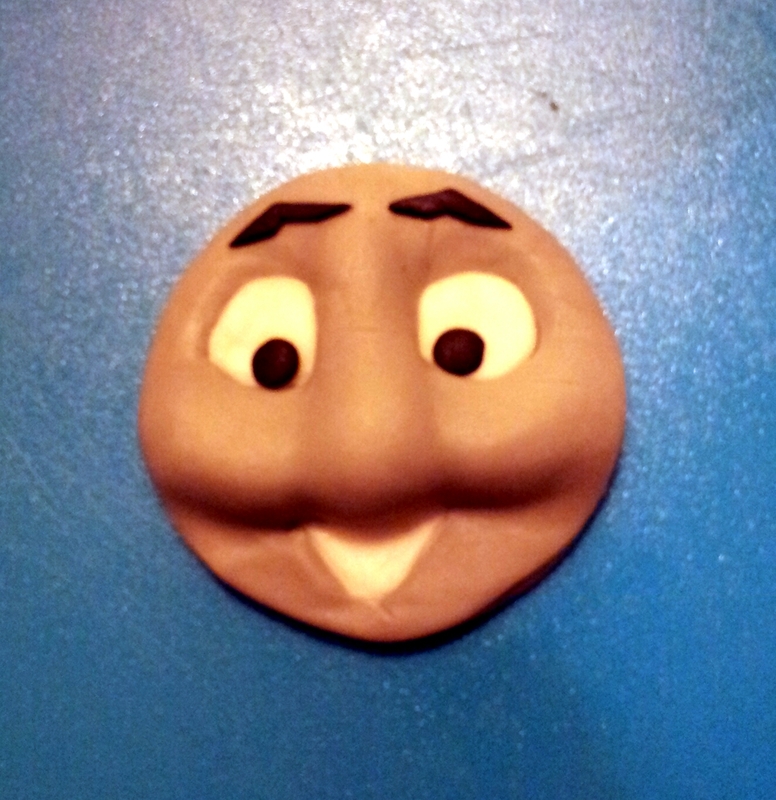 What can I say, trying to get the fondant face looking as Thomas like as can be, I haven’t even worked out how I’m going to make build the cake train yet all this effort for a two year old who will demolish it quicker than the time it will take to blow out his birthday candles! It is a challenge and I’m likely to have nightmares of Thomas for some time, on the plus side it is a good way to develop some crafting skills. As you can see my first attempt was not a rip roaring success and was consequently named ‘Evil Thomas’! 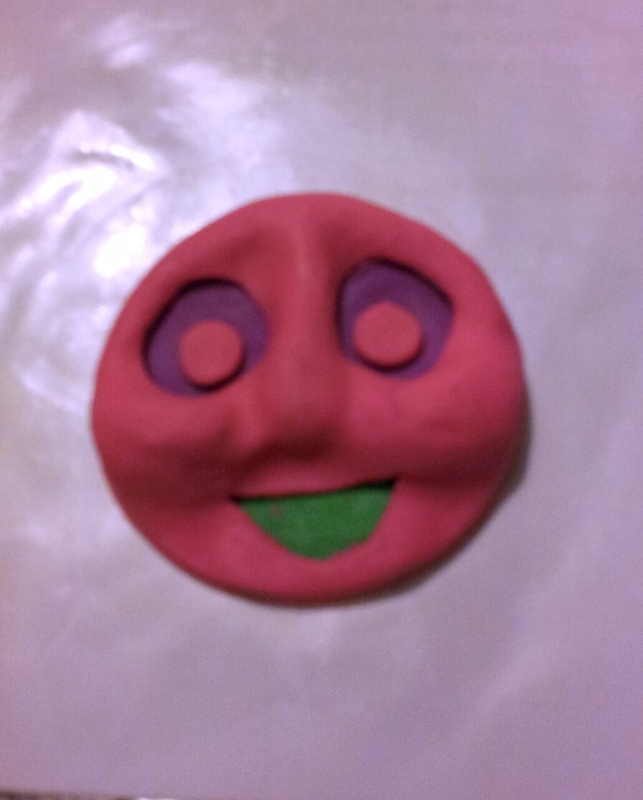 Buy this point I had decided to invest in some plasticine. By the time I had got to the final version I have to admit I was no longer a fan of old Thomas! As my youngest sister pointed out, I had done well from where I started out with ‘Evil Thomas’.